Vista Tower in Chicago’s New Eastside will be one of downtown’s most iconic high-rises once finished. 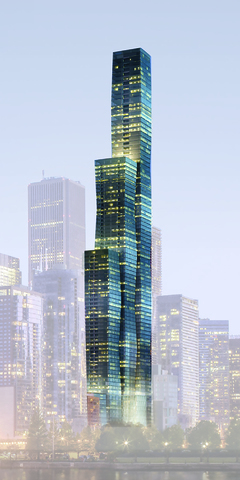 A supertall tower that will stand 1,144 feet high, or 96 stories, Vista Tower will include 406 luxury condominium residences, 205 upscale hotel rooms, 346 parking spaces, and lavish amenities that will rival any other building or hotel in all of downtown Chicago. As one of the premier residential buildings in all of downtown Chicago, condos for sale at Vista Tower Chicago are sleek, stylish, and feature some of the coolest living spaces in town. And while the first 12 stories of Vista Tower will be occupied by the building’s first-class hotel, floors 13 through 93 will consists of a fabulous mix of one-, two-, three-, and four-bedroom condos with prices that generally start around $1 million. It’s also worth noting that on floors 71 through 91 will be an assortment of “Sky Residences,” which boast higher 11’4” ceilings and of course views of the city that are nothing short of spectacular. Want some pretty cool visuals of all the different amenities offered at Vista Tower Chicago? Check out all the different renderings below, or go back to Vista Tower listings on the MLS. When completed, Wanda Vista, located at 375 E. Wacker, will be downtown Chicago’s third tallest high-rise, not not mention one of its most impressive. Nestled alongside the main branch of the Chicago River, Wanda Vista will be comprised of three connected towers—each with a different height. At its tallest point, Wanda Vista will stand roughly 1,100 feet high, or exactly 93 stories. Inside, Vista Tower will house a hotel with 169 rooms, and an astounding 405 full-time residences that will specifically be designed to impress. Designed by Jeanne Gang, Wanda Vista will be the tallest building in the world that’s designed by a woman, replacing it’s New Eastside neighbor, Aqua, which was also by Gang. For now, the estimated completion date for Wanda Vista is sometime in 2018. For more information about Wanda Vista condos for sale, contact Chicago’s Property Shop today at (312) 243-5200! Can't find what you're looking for at Vista Tower? Start browsing other condos for sale in The New Eastside or give Chicago's Property Shop a call at (312) 243-5200 for help with your condo search today!